Assistance and Transport in Louisiana. Call us today! How Do I Find My Towed Car? Where did my vehicle get towed? Getting towed when you’re parked improperly happens fairly regularly. It’s not the end of the world, but it can be an inconvenience. 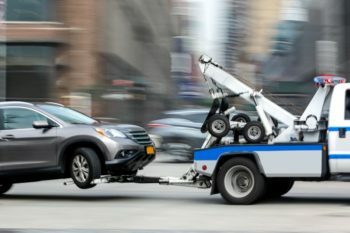 Keep reading to find out the proper procedure for finding your car after it’s been towed away from where you parked it. There are hundreds of reasons for getting your car towed away. Most commonly it’s because you parked in a an illegal spot. On a city street this includes any sidewalk marked with yellow or red paint. Those areas are reserved for emergency vehicles or for other uses. Parking there poses a health and safety risk for the city.You can also get towed if you park in front of an outlet where cars are supposed to be able to drive through. Blocking an alleyway or an entrance impedes the flow of traffic. Private business owners have the legal option of calling a tow truck to haul away improperly parked vehicles. This includes anyone who parks in a designated handicap space without an appropriate sign hinging from their rearview mirror. They can also call when drivers park in one one of their spaces and then patronize another business. You can avoid getting towed by making sure to check both for placards and signs, as well as any symbols or wording painted on the pavement. If your car is gone, your first step to getting it back is finding out where it’s gone. To find out who towed it, take a look at the parking lot. Many businesses maintain an agreement with a specific tow company. They post a sign with contact information for that two company somewhere in the parking area. If, for some reason, they don’t have a sign up, you’ve got to go into the business and get the phone number for the towing company. You’re probably upset, but try to remain calm when you’re talking to the employees who called the truck in the first place. Remember the old saying that you attract more flies with honey than with vinegar. These people can you whom to call. When you talk to the dispatcher at the tow company, they need certain information. Let them know where you were parked when the tow happened, the make and model of your car and your license plate number, if you can remember. From there you can get instructions on how to find and recover your vehicle. What if I got towed by the police? The city’s police force has the power to authorize towing of improperly parked vehicles. If you suspect that this happened to you, call the local police department, rather than 911. They can put you in touch with parking enforcement, who can then explain the next steps in recovering your vehicle. This might take a while, and probably involves paying a fine. You could even have to go to court, depending on the charge. It sometimes happens that you request a tow, but you’re not sure where your vehicle ended up. Before calling for a pickup, make sure that you’re using a reputable company. Next, get the contact information for your driver and save it to your phone. You can then get hold of them if there are any problems. Sometimes, in the case of an auto accident, you might leave or get transported away before the tow truck arrives. If you didn’t have friends or family available to stay at the scene and talk to the tow truck driver, your should call the insurance company. Have your policy number handy, and the claim number if you can. Your agent can use this information to generate a report that shows which tow company got the call. From there you can contact the dispatch office to track down your vehicle. 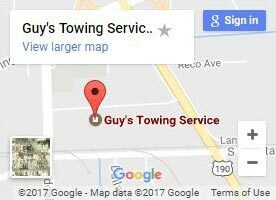 If you find yourself in a spot, turn to Guy’s Towing Service. 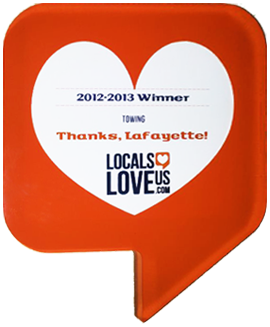 We’re one of the most trusted names in and around the Lafayette region. We started in 1971 and since then worked hard to grow to be the largest operation in the state of Louisiana. Our founder, Guy Benitez, even served as the president of a national towing association. This experience, coupled with our integrity and honesty makes us the right choice for whenever you need a lift. Our dispatchers are available whenever you need us. Emergencies happen any time of the day or night, so we keep a staff on hand 24/7. Just make a phone call for immediate service. If you have a more general question don’t hesitate to fill out the contact form on this site. We get back to you right away and explain everything in clear, plain English. You can get a tow from anywhere, and we know this. Our team goes above and beyond to help you get better service for satisfaction every time. We never overestimate how easily we can get to your location. Our drivers make it to your location on time or even early. Each team member undergoes rigorous, detailed training to ensure that they’re capable of taking care of whatever situation comes our way. This training and service includes our extra large and powerful trucks. If you drive a semi and end up off the road, Guy’s is the outly outfit in the state to call. WE can get you lifted up out of the ditch and back on the road in less time than anyone else. Very few situations are more distressing than needing a tow. We understand the anxiety this causes and do everything we can to make the process easier for you. Call Guy’s today to get you and your car back to safety right away. The best towing service Louisiana has to offer! Call Guy’s Towing Service today. Call (225) 424-8635 for assistance or a tow now! © 2019 Guy's Towing Service. All Rights Reserved.